This picture of Monk was taken last spring. Well, I knew it would happen. As mentioned in other posts...we have been feeding a stray, feral cat for the past year and a half. We call him Monk. He will not let us get near, but he has trained us quite well in having food and water for him and providing a warm place for him to stay if he chooses. Our back porch has become a place to store things before they get taken to the shed or garage. I do intend to make is a livable area...but for now, this is where we store bird seed, peanuts for the squirrels and birds, and Monk's dry cat food. All are in plastic containers. Monk drinking out of the bird bath. This winter we have put a heated pet bed on a chair so that Monk would have a warm place to sleep when the weather was snowy and temperatures dipped below zero. We also have a space heater that we left on during the day. We would leave the door open wide enough for Monk to come inside...and he finally got courage enough to do so. He even began taking naps in the heated bed. We have pondered getting a pet flap for the porch...but so far have not done that. I wonder if Monk would come inside if he could not be assured an open door where he can escape. Monk in his heated bed. Monk has us trained to have breakfast ready around 8:30 so that he can have a nice nap in the heated bed. He then leaves (and we wonder if he might have some other neighbors trained for his brunch) and returns for his dinner at 6:30. He will then take another nap but leave for the night. We close the door and perform the same routine each day. When the weather gets warm, Monk will be fed outside. In fact we have a heated house for him there...but he has shown no interest...so that little house sadly sits next to the heated birdbath that have for the deer, birds, squirrels and Monk. Last night Ray said. "There is activity on the porch." He had set up a surveillance camera to show any activity on the porch. He gets a message on his phone if there is something going on. "We have some uninvited visitors." I knew it! I had feared that the raccoons would find our porch and wondered why we had not seen any. I know the damage raccoons can be and envisioned this one using his little hands to open the plastic container of food. I jumped up, looked out the window and saw two uninvited guests. One raccoon (Rocky) and one opossum (Paulie). They had finished all of Monk's food (he always leaves some in the bowl) and the raccoon was on the chair ready to settle in the heated bed. 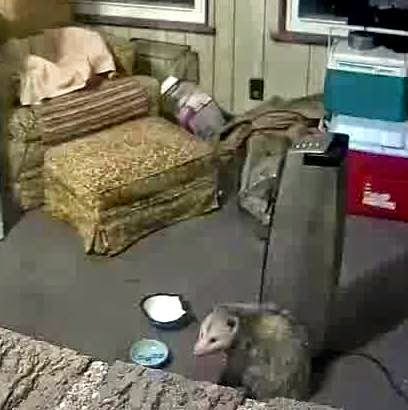 The opossum was just standing next to the heater. a clear picture of Rocky. I got a broom to shoo them off the porch. Rocky waddled out quickly. Paulie just stared at me. I thought he was going to roll over and play dead. If so, I could just use the snow shovel to pick him up and move him outside. (I learned that from my niece, Maggie. She had an opossum that would taunt her dog...and would play dead when she came out...so she would just shovel him over the fence.) But Paulie was not playing dead....he just watched me with those piercing little eyes. By this time Ray came out with a longer broom and nudged Paulie out the door. Paulie protested just a bit...giving the broom a few nips...but finally scooted from the porch. a quick shot before hustling them out the door. Now we will have to be more careful. Monk will have to be satisfied with daytime use of the porch...and since it is getting warmer, he will be eating outside. He has let us know that he wants to remain an outside cat. When spring arrives, I hope to have the porch cleaned up so that our two new kitties, Ary and Molly can enjoy being out there. Until then, Monk is welcome to come out of the cold. Molly and Ary at a quiet time. You are true animal lovers! My sister takes care of a feral cat at her place, too...along with 3 horses, a barn dog, 2 dachshunds, and 2 indoor cats! So sweet of you to care for Monk so diligently. I'm glad your uninvited guests behaved quite well. I wish I was a cat in your neighborhood!!!! Monk has a pretty good life. I'm wondering if he's mentioned this luxury to the other wildlife in the neighborhood. I think Rocky and Paulie were checking out the rumors of the new bed and breakfast in town. This felt like a picture book! I was drawn in and couldn't wait to see what happened to Monk and Rocky and Paulie. I really enjoyed the written descriptions as well as the pictures. Monk is absolutely beautiful. I am jealous, though. I don't have a heated bed. :-) Cats really are good at training us to meet their needs. Our Archie, no longer with us, looked a lot like Ary. As you know, we have a Molly as well. he is a smokey gray with a white patch under her chin.You know I am a softie when it comes to cats, any animal as far as that goes. Yes, I know you are a softie when it comes to animals. Your cat picture is what caught my eye last year when reading blogs...and I am glad I read it. Sounds like a story I'd like to hear...the raccoon who tried to get through the screen walls! I have really enjoyed reading your stories about Monk. Have you ever read the book Charlie Anderson? It is about a stray cat who shows up at a house with two young girls. I don't want to give it away, but it's a pretty clever story. Your story of Monk reminded me of it. I think if I was an animal in anywhere near your porch, I would do whatever I could to move in permanently. That photo of Molly and Ary says it all. Thanks....we really wish Monk would let us pet him....but have to wait until he is ready. I have not read that book...so I will have to get it. Thanks for the suggestion.